The Asylum Movies, A List Of. A creepy spirit kidnaps a boy and forces him to relive stories of the Bible. Raised by two brown flappers, Pingo discovers the power of tapping shoes. A tap a day keeps those goofy walruses away! King Maximus's Dreamzone empire is threatened by his brother Badmess and Dr. Ozox. Delivery car Cruise dreams of being a racer, but his chance to do so wouldn't come until the big race comes to town. Now Cruise must race for the sake of the company he works for, after tow truck Lugnut bets the fortune on the Champion. This is being said with a heavy heart, as a huge lifelong fan of animation (being practically raised on especially Disney films and cartoons), with no malice intended. Have no bias against low-budget animated films, not all of them are bad actually, but really hate it when something looks like a lazily made product and that they weren't even trying. 'Izzie's Way Home' belongs in that category. That it was not made on a high budget was not something that would mark as a strike against it. It would be wholly dependent on how it executed individual components, and not only are all the individual components in 'Izzie's Way Home' done really badly it is a mess as an overall film. Absolutely nothing works here. 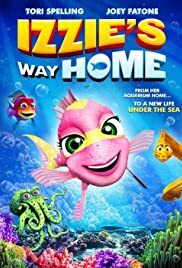 And oddly enough, that it's a pale imitation of the 'Finding Nemo' films (both one of Pixar's best films 'Finding Nemo' and its worthy prequel 'Finding Dory, both infinitely better films and actually good ones too) with a touch of 'Mean Girls' is the least of 'Izzie's Way Home's' problems. What's the worst thing about 'Izzie's Way Home?' The animation definitely, which is horrendous (so bad that summing it up in one paragraph was hard), some of the worst to not have Video Brinquedo or Spark Plug Entertainment's names on it. Heck, even the CGI-'Swan Princess' sequels or those for 'Alpha and Omega' don't look this bad. Have seen people say that it looks like it belongs in the 90s, while it is true that the film's animation looks like 20 plus years out of date, comparing it to the 90s to me is doing the 90s disservice considering even video games made in the 90s look far more professional-looking. Can't decide what's worst. The dull backgrounds that have no vibrancy or careless, almost confusing, attention to detail that never immerses one into the oceanic world? The flat and at times gaudy colours? 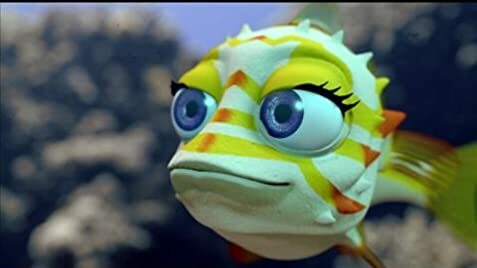 The most eerily lifeless eyes, even a not-easily scared adult would be freaked out, in an animated film ever in existence? The blocky and static character designs? The completely unnatural way the characters move, like they were just floating aimlessly? Or the incomprehensible mouth movement, where telling who was speaking was often impossible in scenes with numerous characters? Take your pick. Have no better news about the rest of 'Izzie's Way Home'. Music is a big part of my life, could barely remember any of that here and the little that was slightly memorable was cheesy and ill-fitting. There is no wit, cleverness or intelligence in the script, it is often insultingly juvenile for any age group that target audience may be questioned and it can be repetitive and confused. As for the story, that's the second worst thing about 'Izzie's Way Home' after the animation. That it's derivative of better films may be slightly forgivable, but unacceptable is that it felt like no heart or charm went into this. This was lazy stuff, with a lack of humour, thrills and emotional investment. It's also very repetitive with some scenes that are either random or illogical in placement and others that don't serve much point and seem there to pad things out. The film is short but feels twice as long, that's how unengaging it is. On top of that, 'Izzie's Way Home' makes no effort to make characters that one willingly wants to engage with and root for. All of them are on the extremes of either dishwater bland to mind-numbingly irritating, not to mention hideously animated and annoyingly voiced. This is including the protagonist and the chemistry between the characters are hardly anywhere to be found. The voice acting is all round poor, especially the ear-bleeding vocals for the bullies.